But it’s true: on December 16th, 1996, I stepped out of a plane and descended a mobile staircase onto the tarmac of Ben Gurion Airport. Some people around me knelt and kissed the ground. I did not feel like kissing anything. It’s a story I usually only refer to in passing. I don’t talk about it much. I mean… it was a long time ago. I’ve spent 2/3rds of my life in this country, and if you were to ask me if I feel more American or more Israeli, I’d say I feel more Israeli. The truth is, though, that the experience of immigrating from the USA to Israel was the formative event of my life. The story of my aliyah is basically the story of how I became who I am today. I don’t regret a thing, and I am very grateful to my parents for bringing me here. I don’t think I ever would have had the courage and stamina to make this choice as a parent. We had a comfortable life in Pittsburgh. My parents owned a two-story house with a big basement and a huge front and back yard. We were part of a close-knit community of religious Jews in Squirrel Hill; we had a religious Jewish day school, Hillel Academy, just a ten-minute walk away. My dad was a physiatrist (rehabilitative medicine physician) making a very comfortable living, and my mom taught karate to women and children in the community. There was no reason in the world to leave–except Zionism. My parents believed all Jews should live in Israel and planned to make aliyah long before I was born. So I grew up knowing that it was something that would probably happen in the distant future, and when it finally started to materialize, it didn’t come as a shock. I remember our first few months in Israel in kind of a haze. I had been taught to read and pray in Hebrew at my school in Pittsburgh, and some extremely basic conversational skills, but it was not enough to understand what was going on in the classroom or to have meaningful conversations with my peers. Even harder than the language barrier was the culture shock. Introversion is… not tolerated very well in Israeli culture. It’s a very social culture, everybody all up in each other’s business. And my classmates interpreted my shyness as snobbery. I made a few English-speaking friends, but most of my classmates either ignored or actively teased me in the first few years. I remember feeling “other,” and intensely lonely. I went from easily the top of my class in Pittsburgh to doing literally nothing in the classroom. Most days I brought along a book in English and read instead of even trying to understand what the teacher was saying. It was really, really tough. I cried often. I missed my friends and my old life terribly. I fought with my parents and siblings regularly. There was a period I spent 15 minutes every morning throwing a tantrum and screaming at my mother that there was no point in going to school and I didn’t want to go. It didn’t help that I’m highly sensitive, which meant that relative to other children my age, I experienced emotions and relationships very intensely… and that I had already had a history of depression and anxiety. I was seeing a psychotherapist regularly from second grade up until I made aliyah. About a year after aliyah, my family went to a “family therapist” for a few sessions, but other than that, I didn’t have professional emotional support. When I look back on that period, I see that I developed some creative coping mechanisms, using fantasy and creativity as an outlet for my loneliness and sense of helplessness. As you’ve probably guessed, one coping mechanism I developed was writing. I kept a daily journal of my thoughts and experiences, starting a few weeks before the aliyah and ending in the summer of 1997. 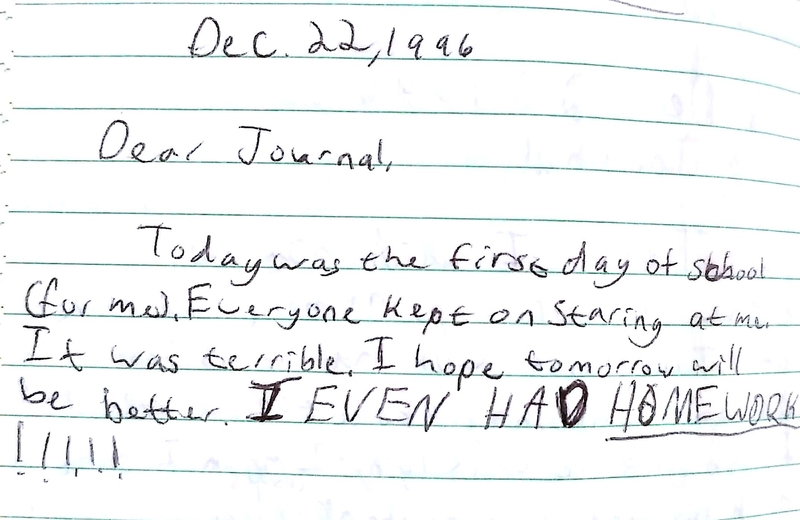 Six months later, I started another diary, which I wrote in every day all through 1998. 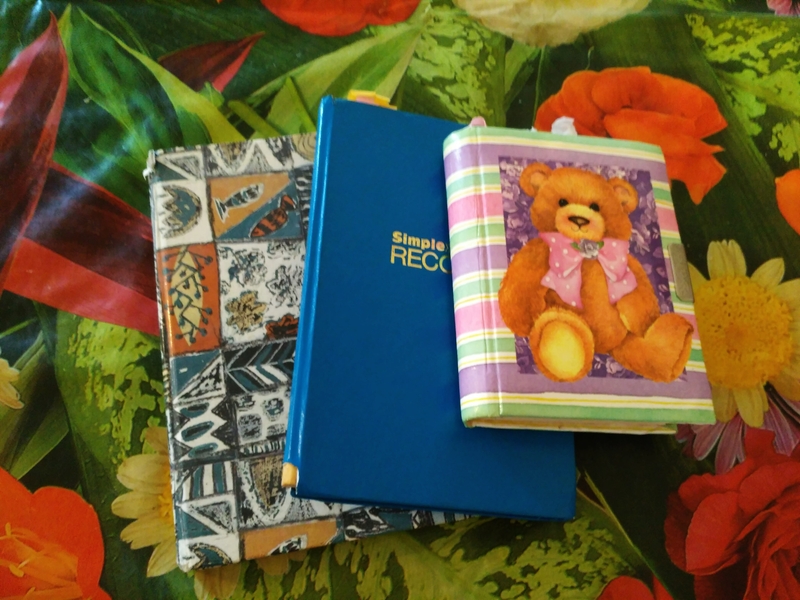 I also received a hardcover notebook for my birthday that year which I started to use as a poetry book. I still have all three of these, and they are among my most treasured possessions. Not sure what I crossed out there, but my mixed feelings definitely come across! 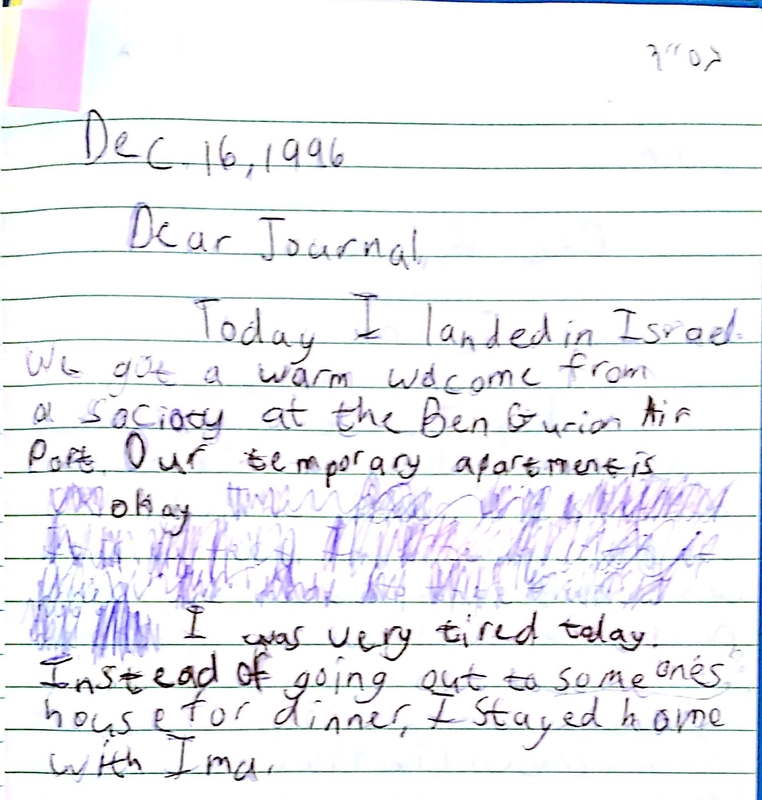 At age ten, just a few months after making aliyah, I wrote my first chapter book. It was called “To Keep the Peace” and recounted the adventures of yours truly and my real-life British friend Shareen, who, upon learning that the USA and the UK were about to go to war with each other, flew to London and Washington D.C. to convince the Queen of England and then-President Clinton not to fight. It was ridiculous and beyond adorable. And looking at it from a psychological perspective–how awesome was I? I gave myself agency and freedom and the power to cross oceans and change the world through fantasy and creative expression. What a wonderful coping skill! After writing that book, I had a definitive answer when people asked me what I wanted to be when I grew up: an author. 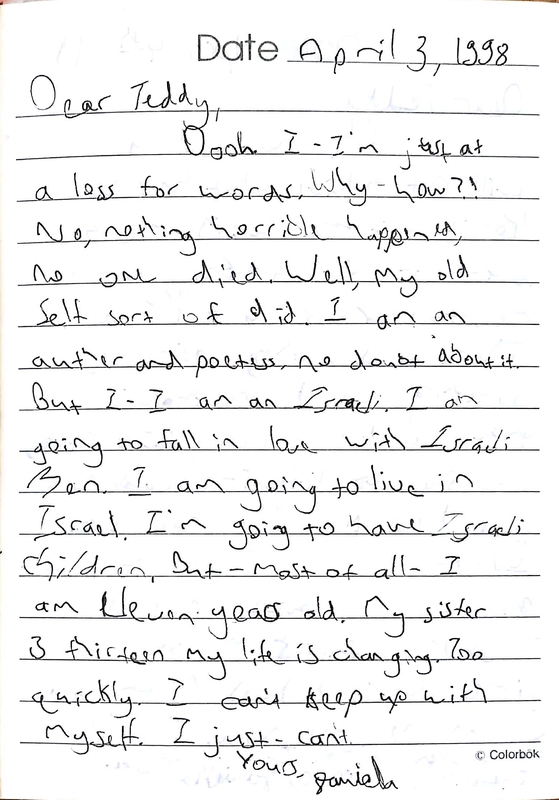 11-year-old Daniella philosophizing about the passage of time and what her future holds. 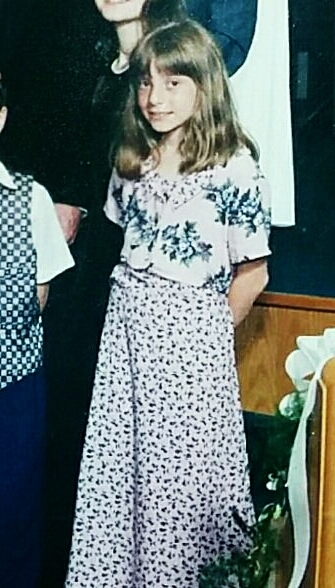 With the gift money I received for my bat mitzvah, I purchased a computer, which was a pretty standard thing to do with bat mitzvah gift money, but the thing I was looking forward to most about it was fairly non-standard: I wanted to start writing my first novel. And that’s exactly what I did. At age 14 I completed it, and a few months later, completed another novel I had started writing in the meantime. When you and I met four years later, I had already penned five full-length novels. By Light of Hidden Candles is my sixth. Over time, my grasp of Hebrew improved, and I learned to find my place within Israeli society. I was in eighth grade when the Second Intifada broke out, and was volunteering for OneFamily, an organization that assists terror victims, as it was tapering off. So my entire experience of high school was on the backdrop of some very grim and scary things going on. For my part, it had the effect of strengthening my connection to Israel. 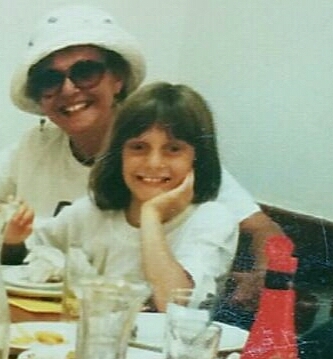 That sense of solidarity I write about, the way Israelis cope with terror, helped me feel a part of something, and helped me understand very deeply why my parents had brought me here. This is my people, this is our land, and I wouldn’t want to be anywhere else. Basically… I grew up with one foot in each world, struggling to make the transition to the new one while clinging nostalgically to the old one. Reading my writings from that period is kind of heartwrenching: there’s this girl, on the seamline between childhood and adolescence, facing an upheaval in her life that was too big for her to fully comprehend, simultaneously finding relief in her rich imagination and criticizing herself for having her head in the clouds. Story of my life in a nutshell. 1) Today is the last day you can download Letters to Josep: An Introduction to Judaism for free! Don’t miss out! 2) *ahem* Speaking of my novels… if you’re subscribed to my newsletter or you follow my other blog, you already know this, but I haven’t announced it here yet: my debut novel, By Light of Hidden Candles, is scheduled for publication by Kasva Press this coming fall! It’s about an American Jew of Sephardic-Moroccan descent and a Catholic Spaniard who team up to research their families’ respective histories… only to discover that their pasts are inextricably linked. Woven into their narrative is the story of their ancestors in late 15th-century Spain: a Jewish family that runs into trouble with the Spanish Inquisition, and the Christian family that comes to their aid. For more information and updates, make sure you’re subscribed to my newsletter.